This power bank weighs in at just 148 grams yet offers a 2.4A charging output that can halve the time taken to fully charge your mobile devices. Using iSmart Technology, the RAVPower 6700mAh portable charger can charge faster and smarter than other devices as it automatically detects the optimal charging current then delivers this to the connected device, thereby always ensuring the most efficient and quickest charging. This compact charger fits in the palm of your hand yet has an amazing capacity of 6700mAh which can easily charge the iPhone 6 or the iPhone 6s twice, or more than one full charge for large mobile phones like the iPhone 6 Plus or the Samsung Galaxy Note 4 (note Apple cable is not included). 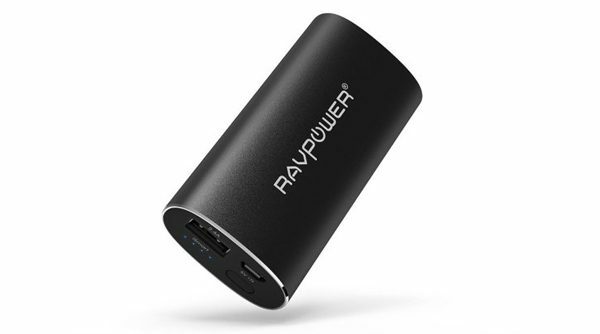 The RAVPower has to be one of the most stylish power banks on sale right now, with an ergonomic design and gorgeous metal shell with 4 status LED’s. Using an ultra reliable lithium-ion battery, the RAVPower 6700mAh Portable Charger is good for over 500 full battery charge cycles and features the latest safety technology to protect your mobile devices including short-circuit and over-current protection with automatic shutdown. It’s fast too, for example you can charge a Lumia 830 or an iPhone 6s in under three hours, plus there is enough capacity for around 2 full charges for most smartphones to keep them powered throughout the day. The iSmart technology ensures your devices always charge safely and efficiently by controlling the USB port output and all the technology is wrapped in a scratch-resistant alloy shell. The device itself can be fully recharged using included Micro USB cable in 3-6 hours.